In June 2015, Little Rascals proudly published the following testimonial from animal abuser Robert Koch to their website and Facebook page. CLICK TO VIEW ~ Testimonial for Little Rascals Pets Ltd from one of their customers -convicted animal abuser Robert Koch who received a six month prison sentence after being found guilty of systematically torturing and mutilating puppies. “ Following the BBC programme on puppy farming I was so hesitant when I arrived at Little Rascals as I did not know what to expect, especially as I had had such a bad experience with a puppy farm in Wales-Clunderwen, so upon my arrival at Little Rascals I did not know what to expect. Not only was I greeted at the railway station by a charming partner of the business who took me to the farm, but the same again at the farm. I looked around and felt so good immediately to see it was not converted horse stables being used, but instead the cleanliness was incredible not only at the shop where you are welcomed but when you go to choose your puppy the floors, walls and surroundings were spotless no poo on the floor, fresh shavings on the floor not being sodden with urine and the dogs in a happy and content and NOT stressed state. 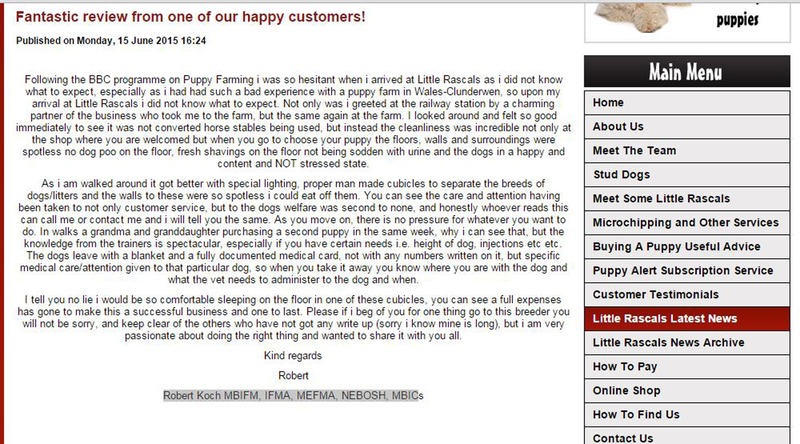 Little Rascals Pets Ltd posted a glowing testimonial from convicted serial animal abuser and killer, Robert Koch, indicating that they sold him at least one puppy. As I am walked around it got better with special lighting, proper man made cubicles to separate the breeds of dogs/litters and the walls to these were so spotless I could eat off them. You can see the care and attention having been taken to not only customer service, but to the dogs welfare was second to none, and honestly whoever reads this can call me or contact me and I will tell you the same. As you move on, there is no pressure for whatever you want to do. In walks a grandma and granddaughter purchasing a second puppy in the same week, why I can see that, but the knowledge from the trainers is spectacular, especially if you have certain needs i.e. height of dog, injections etc etc. The dogs leave with a blanket and a fully documented medical card, not with any numbers written on it, but specific medical care/attention given to that particular dog, so when you take it away you know where you are with the dog and what the vet needs to administer to the dog and when. I tell you no lie I would be so comfortable sleeping on the floor on one of these cubicles, you can see a full expenses has gone to make this a successful business and one to last. Please if I beg of you for one thing go to this breeder you will not be sorry, and keep clear of the others who have not got any write up (sorry I know mine is long), but I am very passionate about doing the right thing and wanted to share it with you all. Robert Koch had been under investigation for extreme animal cruelty since June 2014 and warned by the authorities not to purchase any more animals while the investigation was ongoing. He disregarded that order, purchasing more puppies and visiting Little Rascals in June 2015. Koch systematically abused, tortured and killed many puppies over a long period of time. From at least 2014, Robert Koch had been known to the authorities for purchasing puppies with the sole intention of tormenting and mutilating them. The details of the horrors inflicted on those puppies are well documented in the articles below and we don’t feel we need to repeat them here. Koch continued to purchase puppies even after being ordered not to by the authorities, purchasing at least one puppy from Little Rascals. Some of those puppies survived the torture and injuries Koch inflicted on them, others had to be put to sleep. When Little Rascals posted Robert Koch‘s testimonial to their website and Facebook page in 2015, we assumed they had written it themselves, owing to the poor grammar and infantile style of writing. But tragically it seems that Koch submitted the review himself, confirming his visit to Little Rascals with the sole purpose of purchasing a puppy to torment and mutilate and, since anyone can buy a puppy from Little Rascals, with absolutely no questions asked, Koch was free to do as he wished. Dead male puppy found in a refuse bin on Robert Koch’s property. The puppy had cable ties around his neck. Until this sick culture ends where anyone can freely purchase dogs from puppy farmers and dog factories through websites, classified sites and pet stores, with absolutely no customer checks and evaluations ever undertaken, tragic and horrific incidents like this can, and will, happen time and again. We just have to keep on fighting the existence of puppy farms. I sometimes think if all the campaigners joined forces and we had one big campaigning organization with many followers and more power to the elbow would it be easier to achieve our goal?